We would upsize on space and downsize on stuff- and voila our life would be more Real Simple/Martha Stewart and less that show called Hoarders with the crazies and all their junk. So we were over at Mark's mom's house going through boxes and boxes of stuff he had over there. Dividing into trash, keep, and goodwill. I opened a box which was full of toys and told him I was putting it in the Goodwill pile. At which point I was suddenly engaged to a four year old. He opened the box and his face lit up into what I imagine my face looked like when he proposed to me. That excited. "Ohmygosh we can't throw THIS away... this was my favorite toy!" He picks up some sort of helicopter thing. And all these little pieces fall out. "Oh and this was my favorite toy too... there should be a key for the bottom around here somewhere and then we can watch it can morph." The key was nowhere to be found. At which point I informed him that things morphing don't really interest me. And does he know what the term favorite means? They can't ALL be his favorite. "Oh I bet you didn't have one of these when you were little (holding up a Talkboy) we can't throw this away it's a classic!" 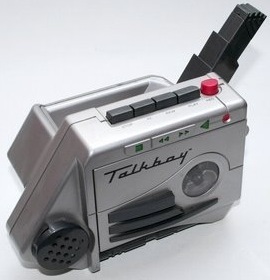 At which point I informed him that no, I didn't have one, it was called a TalkBOY and I was a girl and so maybe that's why I didn't see the magic in it... but I did know that it along with all the other toys were going to Goodwill. "But look at this toy car... I totally rebuilt it myself when I was seven!" The car was missing a wheel, and what I would call an axle. It was a remote control car... with no remote to be found. At which point I informed him that now he can rebuild real things. Like the flipping boat he bought last year. "Oh my gosh look! A whole bag of marbles... perfectly good marbles... we can't throw these away." At which point I informed him that he could only keep what he planned on actually using in the future. And that if he planned on pulling out his half-broken toys and playing with them on our new living room floor then I may have to re-evaluate our engagement. PLUS think of all the little kids just like him that would be soooo happy to have those toys! AND someday we will have kids of our own and I promise he can play with their toys whenever he wants. And with a sad, sulky look on his face he took the box over to the Goodwill pile. But we did have to do some negotiating. And so we kept the friggin' marbles. But so help me if he doesn't play with them in the next month they are going in the trash. Kill a bajillion birds with one stone! Happy Birthday America & King!